Epithelium consisting of one or more cell layers, the most superficial of which is composed of flat, scalelike or platelike cells. a sheet of flattened scalelike cells, attached together at the edges. Also called pavement epithelium. Epithelium consisting of a single flat layer of cells. 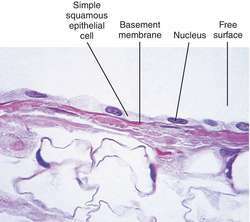 An outer layer of a surface (epithelium) that is composed of flat, scaly cells. Epithelium consisting of a single layer of cells. Treponema pallidum IHC stain highlighted organisms predominantly in the lamina propria, under the squamous epithelium, and concentrated around vessels. The oral tumours show proliferation of stratified squamous epithelium in broad processes with keratin cores and keratin filled crypts which seem to burrow into bone, but lack obvious cytological features of malignancy7. As for group II, the diagnosis of severe grade of dysplasia of squamous epithelium (CIN 3) was made in 17 (50%) patients , a moderate dysplasia of squamous epithelium (CIN 2) and mild dysplasia of squamous epithelium (CIN l) was found in 10 (29. The cutoff for R between normal squamous epithelium and low grade lesions was 11. The apical portion of the clitoral urethra was internally lined by squamous epithelium and no urethral glands were found in the mucosa. The epithelial lining was stratified squamous epithelium of 6-8 cell layered thickness, showing detachment from the underlying collagenous capsule with palisading arrangement of nucleus in the basal layer. The histologically prepared specimens of the lesions were lined by parakeratinized stratified squamous epithelium containing layers of only approximately 5-6 cells before the marsupialization procedures. 1) Oral epithelium is classified into three types based on their morphology and specific pattern of differentiation: keratinized stratified squamous epithelium (masticatory mucosa distributed in hard palate and gingiva), non-keratinized stratified squamous epithelium (buccal mucosa, labial mucosa) and specialized mucosa (dorsal surface of the tongue). Histopathological findings consisted of cyst wall lining of stratified squamous epithelium with sebaceous glands, blood vessels, muscle and cartilage in the underlying connective tissue, and a diagnosis of teratoma was made (fig 2). Simple squamous epithelium was present on the central third of the endoluminal surface of animal 4's prosthesis (Figure 5). Extensive sampling of the tumors and surrounding breast tissue after mastectomy would have given the definite answer regarding the presence or absence of metaplastic squamous epithelium in the ducts or any other associated pathology. The surface part of the squamous papilloma with prominent nuclear dysplasia and the loss of stratification and polarisation in hypercellular squamous epithelium were seen and also the papilloma showed prominent dysplastic figures and dyskeratotic cells.